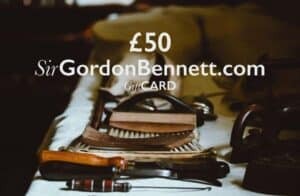 Sir Gordon Bennett believes that our great British manufacturers do what they do best and that is make products that you will cherish and want in your lives. So, unlike many other online retailers of crafted goods we don’t make manufacturers ship to you, we do that and let them concentrate on what they do best. At Sir Gordon Bennett we have tried to keep shipping as simple and as affordable as possible. And any saving that we make through scale or deal we will pass it on to you. If you become a 'Friend of Sir Gordon' then you will automatically have free shipping. To become a Friend of Sir Gordon simply sign up to Gordon'sBUGLE, either via one of our pop-ups or the registration page. The chart at the bottom of the page explains all of our shipping costs. We do our upmost to to deliver within these timeframes with our partners but at times deliveries can take a little longer. We can not take responsibility for late delivers that are out of our control. If you do become a friend of Sir Gordon, fair usage of free delivery is required. We would kindly ask you to treat us like any other friend and to try and keep your orders over 30GBP otherwise it makes it hard to actually offer free delivery. We hope you understand. Worldwide delivery - We currently have no fixed costs to send to territories outside the EU however we are currently working on Worldwide delivery. And if you are interested in purchasing goods from us then we'd really love to hear from you and will endeavour to make some bespoke arrangements. Send us an email to hello@sirgordonbennett.com with a few details, we'll get back to you as soon as we can. For your protection, goods will remain the property of Sir Gordon Bennett until they have been delivered and signed for. With regards to export outside of the EU, all of our goods are supplied Delivery Duties Unpaid, so should you purchase from us and if you live outside of the UK or EU you will have to ensure you are willing and able to pay all relevant local taxes, duties and fees upon the arrival of your goods at customs. We know that you will fall for your order but if for some unforeseen reason you need to return you order we have set out our returns policy below. If you want to return an order you must write to us within 7 working days after receiving the order, this of course includes sending an email or carrier pigeon. The order must be returned to us within 10 working days of receipt of the order and the items must be in the same condition in which you received them, goods must not be used, all tags still attached and in the same condition in which you received them. Products that have been damaged in transit to you will of course be replaced and the cost of returning to us also refunded. We will refund any returned items in full, including the cost of delivery to the customer, as long as they are returned as above and are not sale items (i.e. those items with a reduced price). Excluded items - those for which returns are not accepted - include beauty products, underwear and ‘personal’ clothing, jewellery, and wind instruments (whistles and harmonicas). Sale items can only be returned for a credit note, a monetary refund is not available. The cost of returning an item to us is your responsibility and we recommend you use registered delivery and keep a receipt as we cannot accept responsibility for orders lost or damaged in transit by a third party and so you will be liable for any damage or loss. The above does not affect statutory rights. For our legal terms on returns please see our Terms & Conditions.